Abi is a servant at Greave Hall, a stately London home. She runs away, but is soon recaptured, to suffer once more under the tyrannical rule of Mrs Cotton, the housekeeper. The house, though, has a darker secret. Something ghostly inhabits the corridors, leading Abi to the very truth someone has tried so hard to bury. 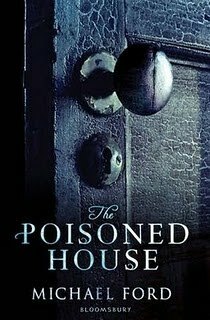 The more she discovers, the more her life is in danger, as she begins to unravel the mystery within the poisoned house. A gripping and masterfully woven story of intrique, passion and greed. My first impression of this book was that it looked quite boring and a little bit scary...I'm not a big fan of historical stories, or scary mysteries, so let's just say I wasn't extremely excited to have the opportunity to read this book. But I decided to read the first page, to give it a try. And I'm so glad I did! I loved this book and I think it's a great novel for anyone who hasn't read this kind of book before. For me, there were no boring bits and you could never guess what was going to happen next so it did keep you reading. I quite like the cover although the colours are a bit dull (yes, I know, it's a book set in the 1800s so of course it's going to look a bit dark - I just think it could do with a little bit of colour.) so I don't think it's very eye catching. My favourite character....hmm...hard to choose! I think my favourite character is Lizzie, another servant who is Abi's friend. She's kind to Abi and tries to stick up for her if Abi somehow gets in trouble. If you like a novel with surprising twists and scary bits, this is for you. And the ending is the best ending I've EVER read, seriously! It was so surprising and scary but good as well! I give this novel a rating of 5/5. I really hope there's a sequel, because the ending sentence made you want to read more. I'm glad this book won you over - it sounds great! Thanks for the review. I got this book also, but I haven't read it yet - and I thought the cover looked quite interesting! It is completely different to other covers around now, so I thought it would be interesting to see what the book was like with this cover on the front. Thanks for the review, I will keep in mind your review whilst reading!